There are a lot of ways to earn money from home. You can freelance. You can start your own online business. You can even turn your hobby into a money-making enterprise. And that doesn’t even scratch the surface of home-based income generators when you factor in all the extra income sites and gigs out there. Sure, having flexibility to work when you want and as much as you’d like is great. And, having several sites in your work-from-home arsenal to turn to when you need extra money ASAP is a good idea, too. But, what if you want a work from home career and not just a way to earn a couple extra dollars here and there? Fortunately, you can have the best of both worlds when you land a full-time work from home job with benefits. More than 3 million people use Buffer (myself included!) to help manage their social media presence. To keep all those users extremely happy, Buffer employs a diverse workforce that is distributed all over the world. And that’s one of the benefits of working for Buffer: You get to work wherever you’re happiest. Some other notable benefits at Buffer include the freedom to pick up and travel while working and no set schedules or hours to keep track of. Plus, team members are invited to Buffer retreats three times a year where they can all work together face-to-face, bond, and grow as a team. Think you’ve got what it takes to join them? Check out Buffer’s hiring page to find open roles in categories like Marketing, Happiness, and Product & Engineering. Buffer has a unique company culture that is driven by the 10 Buffer Values — a must-read for anyone interested in working there. InVision is the world’s leading design and collaboration tool. When people use InVision, they can easily make working prototypes, have real-time design meetings, and quickly share what they’re working on with others — and that’s just some of the features. While there’s certainly a lot of engineering careers at InVision, there’s also opportunities in Sales, Marketing, Finance, and Human Resources. When you join their team, you’ll be joining a full distributed workforce. This means you can work wherever you want. Some other benefits worth mentioning include a free gym membership, broad personal coverage health insurance, competitive salaries and options packages, and generous allowances that can be used for conference travel or new equipment. You may not recognize the company Automattic at first glance but you might be familiar with their work — they’re the masterminds behind WordPress.com, WooCommerce, and popular plugins like Akismet and Jetpack. When you join Automattic, you get to call yourself an Auttomatician while working wherever you’re happiest! Some other amazing benefits employees at Automattic receive include an open vacation policy, coworking allowances, open maternity/paternity leave, and fully-covered company travel — just to name a few. Ready to call yourself an Automattician? Check out Autommatic’s openings for everything from Code Wrangler to Happiness Engineer to find the perfect position for you. If you’ve been after a career that comes with a 10-second commute, you should check out career opportunities at Meet Edgar. As a social media scheduling tool, the team at Edgar is on a mission to help bloggers, marketers, and solopreneurs more consistently manage their online presence in as little time as possible. Team Edgar is growing by leaps and bounds, so you never know what position will be available next. It’s best to check their careers page often so you never miss out on the opportunity to call an octopus your boss (you’ll get it when you see their logo). All employees get a chance to work remotely. Full-timers get 75% of their health insurance paid for, 401k matching, and money to cover continued-education materials. If you’ve got an AmEx card in your wallet, you know they tend to offer their cardholders some pretty nice perks. And this spirit of generosity is often provided to full-time AmEx employees, too. The most popular work from home job at American Express is their Virtual Customer Care Representative position. This role offers a pay rate starting at nearly $16.00/hour. And, if you work full-time, you’ll be eligible for benefits like tuition reimbursement, flexible spending accounts, paid maternity/paternity leave, and health insurance. From time to time, American Express also has remote opportunities for Travel Counselors. Make sure to search all available work from home opportunities by checking out their Hiring Page. Zapier is easy automation for busy people. What does that mean? With Zapier, you can let computers do more work so you can focus on the things you do best (what’s not to love, right?). As a fully-distributed team, you can work anywhere you’d like. Additional equally awesome benefits offered to Zapier employees include healthcare, profit sharing, 14 weeks paid leave for new parents, and 2-3 all-expenses-paid company trips each year. Head on over to Zapier’s hiring page to throw your hat in the ring for positions like Customer Champion, Support Engineer, and Application Reliability Engineer. As an At-Home Advisor for Apple, you can help customers over the phone, email or chat with general questions or tech support. Advisors work all over the U.S. and receive competitive pay that is based on experience. As an Apple employee, you may also be eligible for product discounts and a free Mac to help you get your job done! Other benefits at the tech-giant include stock plan options, paid time off, and healthcare coverage. When checking out current openings at Apple, keep in mind that the city listed in the job details doesn’t apply to their At-Home Program. As long as you live in the U.S., you can submit your application for any of their At-Home Advisor positions! Sitel handles the customer service needs for many different companies, large and small. To meet the demand of their clients, Sitel has an entire Work@Home Agent Program. As a Home Agent, you may assist callers with everything from billing questions to helping them place an order — it just depends on the projects you work on. The majority of Sitel’s clients are in industries like healthcare, finance, retail, and hospitality. When you work at Sitel, you can expect competitive pay on top of benefits like employee discounts at Sitel-partner brands, 401k, holiday pay, and healthcare packages. Simply put, GitHub is how people build software. More than 14 million community members use GitHub to discover, collaborate, and share a variety of projects. You can help them make collaboration even better when you join the GitHub team! GitHub is headquartered in San Francisco, but many of their workers live around the world. You too can join their remote team and enjoy benefits like flexible work schedules, 100% coverage of health insurance premiums, four months of paid new-parent leave, and gym memberships. Open positions at GitHub include titles like Graphic Designer, Account Support, and Product Manager. If you don’t see an available job that fits your skills and expertise, just send them an email — they’re always interested in hearing from potential candidates who want to join the GitHub team! If you’re serious about landing not just a work from home job but a full-on work-from-home career, it’s a good idea to give your resume a onceover to make sure it reads as remote-friendly. Today, hiring managers seeking telecommuters want candidates with the motivation and self-discipline to do their best work, even when no one’s watching. Fortunately, you can make a few tweaks to create a work from home resume that shows you’ve got what it takes to get the job done, no matter if you’re working from home or Starbucks. If you’re looking for even more full time work from home jobs with benefits, be sure to search on Indeed. Type “remote” in the search box below for the latest telecommute, remote, and work from home listings. And don’t forget to like Work from Home Happiness on Facebook where I share a daily job lead and other helpful work from home advice and information! P.S. 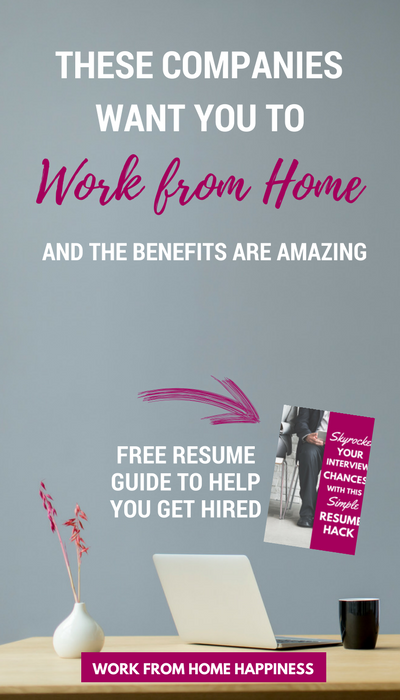 Grab your free copy of my resume guide to help you get hired at amazing remote companies, like the ones on this list! This post may contain affiliate links. Please see the disclosure statement for more information. Hi Ashlee: I hope your weekend has been fantastic! Thanks for your emails. I work for a hospital for the past 13 years, I am a secretary/administrative assistant,bilingual with excellent communication skills. My question is do you ever see or find jobs to work as a secretary at home? I took a Virtual Assistant course but I am not ready to stay home yet because I have some bills I would like to pay first. I would love to work at home some extra hours so I can get those bills paid. If in your research you see something like that can you please post it? Thanks so much for all you do to help others. Many blessings! I am subscribed to your emails. Thanks for stopping by! You know, I don’t really see ads seeking remote secretaries. However, I do come across a number of companies that hire virtual receptionists. This is pretty much answering incoming calls and taking messages for small businesses, busy professionals, and solopreneurs. Is that something you’re interested in? Yes something like that would interest me . I’d love to hear about that also! I am to interested in working from Home Secretary. Can you email me the information. I’ve been looking for quite some time for a remote position. I am very interested t learn more. How can I gain more information and ultimately employment? I am a first time mom, and I’m quickly realizing that my current career is not at all conducive to my new life, so I’m thinking that a work-at-home gig is the way to go. However, I noticed that a lot of the jobs posted by the companies you mentioned require a technical background. Although I do consider myself pretty tech savvy, that is not my expertise. I currently work as a behavior analyst, and I have a masters degree. I have experience in customer service, and I would consider myself to be creative and artistic. I also really enjoy writing. Can you think of any work from home Jobs that would be more up my alley? I’m not really sure where to even start looking because I don’t know what my experience would qualify for. I am looking for a medical billing position online. I have been a family practice medical biller/coder for the past 21 years. I am not a certified coder,but have doing been coding for 20 years. I have billed all insurance groups along with entering the remittance advice electronically within a practice management system. There isnt anything I havent done within the revenue cycle for medical. if you have any resources or leads to a virtual position, please send my way. I am looking for a medical billing position online. I have been doing medical biller/coding and authorizations for the past 25 years. I have billed all insurance groups along with entering the remittance advice electronically within a practice management system. There isnt anything i haven’t done. If you know of anything please share with me I would appreciate it. Hi Ashlee! I am have been trying to break into the work from home game for awhile and am finding it difficult to get in the door. Currently I am an administrative secretary and would love something administrative or clerical. I dont have my own computer, we have wireless internet, and I can’t really afford buying a computer “just in case” I get a job. Any suggestions? I am really discouraged. I am determined to enter the work from home world but i am having a hard time entering! How long did it take you to transition into your work from home career? Did you have any experience in writing before you became a freelance writer? Thanks for stopping by! I had absolutely zero professional writing experience before I started freelance writing. I found the hardest part was actually getting started. For the most part, I kept thinking no one would want to pay me to write for them. But, as it turns out, there are plenty of people very eager to buy writing as a service. It’s all about building confidence in the beginning and, of course, actually getting started 🙂 Let me know if you have questions! I am also interested in learning more about remote receptionist positions.